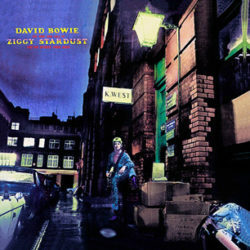 The first of five albums we’ll be listening to during this journey, Ziggy Stardust is memorable, from the title of the album, to the power ballad that is “Ziggy Stardust”. I first heard this song thanks to one of the Guitar Hero games, so I was excited when I pulled this album’s number. It was just as good as I remembered, and there are some other notably great songs on here like “Lady Stardust”, and “Suffragette City” (I believe that was another Guitar Hero hit). The whole album feels cosmic, and is just fun to listen to. It’s easy to see why this alter ego was so damn successful.